Revived plans to build a pair of skyscrapers along Boston Harbor are finding a newly receptive audience in City Hall, signaling a possible end to a long-running real estate feud that has for years stalled the redevelopment of prime waterfront. Mayor Martin J. Walsh’s administration said Wednesday that it is open to tall buildings on the site of the Harbor Garage, as long as developer Donald J. Chiofaro’s plan also provides adequate open space and public access to the water. The 600-foot-tall complex of buildings proposed by Chiofaro includes a 70-foot public arcade that would give visitors the rare opportunity to walk down steps directly into the harbor. And the arcade would have a retractable roof allowing for lush landscaping in summer and ice skating in the winter. “We are confident that the unprecedented benefits we can provide will more than offset the impacts,” Chiofaro told a waterfront planning committee Wednesday afternoon. His $1 billion proposal would demolish the hulking Harbor Garage on Atlantic Avenue and move its 1,400 parking spaces underground. He would replace it with two towers — one 600 feet tall, the other 550 feet, both far higher than the property’s recommended height limit of 200 feet. The towers would contain up to 300 hotel rooms, 120 luxury condominiums, and three levels of retail and restaurants. Wednesday’s meeting was the first step in a revival for Chiofaro, one of the city’s most colorful developers, and his highly ambitious project. His previous versions — with taller towers, one reaching 780 feet — had been blocked by Thomas M. Menino, the former mayor. The two men became locked in an unusually public feud over the project. But the Walsh administration is striking a different tone, saying it would consider building proposals that exceed the area’s recommended height limit if they provide the open space and waterfront access required by law. The project must clear a number of hurdles before construction could begin. Although Chiofaro’s proposal drew considerable praise Wednesday, neighbors and members of the waterfront planning committee questioned the density of the development, impacts on traffic, and the shadows it would cast on surrounding property and the water. Any new buildings would need to be approved by the BRA and state environmental officials who enforce requirements that waterfront developments devote half of the site to open space, among other rules. Although Chiofaro’s proposal would increase open space on a site that now forms a barrier to the water, it is slightly short of the required 50 percent of open space. State regulations also require the public space be open to the sky, raising the question of whether his proposed retractable roof meets the technical definition of the rules. During his presentation Wednesday, Chiofaro did not provide images of the tops of his buildings, saying he wants to gather more public reaction before completing the design. The absence of tower images — usually the most controversial aspect of any new building — allowed him to focus on the improvements he intends to make on the ground floor. Those include shopping and dining options, along with new views of the water. “We will continue working from the ground up and describe how we think re-imagining a site with zero open space today can ultimately provide so many of the benefits contemplated” in the municipal harbor planning process, Chiofaro said. He emphasized his project would open up new views of the ocean from the adjacent Rose Fitzgerald Kennedy Greenway and would add more than 27,000 square feet of public open space where there is currently none. He said the 70-foot-wide public arcade on the ground floor would connect the Greenway to the harbor, creating more opportunities for waterfront dining, shopping, movies, and concerts. In spring and summer, it could have an open-air lawn and seasonal landscaping. In winter it could be used for an indoor skating rink about the size of the one at New York’s Rockefeller Center. Chiofaro and his architects — Kohn Pedersen Fox Associates of New York and ADD Inc. of Boston — said the project would become the eastern terminus of the city’s “high-spine” of buildings, the line of towers that runs from the Prudential Center in the Back Bay to the downtown waterfront. They noted the complex would be surrounded by other tall buildings at Atlantic Wharf and in the Financial District. The harbor planning committee is charged with making recommendations to the Walsh administration about what should be built along the downtown waterfront between the North End and the Evelyn Moakley Bridge. The committee is reviewing plans to improve public spaces and private development sites. The Harbor Garage is among just a few remaining development sites on the downtown waterfront, which boasts some of the city’s most popular attractions but remains oddly disjointed in places. Chiofaro and his partner on the project, Prudential Financial Inc., bought the property for about $155 million in 2007. After his initial development effort failed, the typically outspoken Chiofaro has kept out of the media and redoubled efforts to work with community planners and improve the property’s ground floor. He has also floated his plans inside City Hall. Still, Wednesday’s meeting offered glimpses of Chiofaro’s previous combativeness. The 68-year-old developer jabbed a finger into the air as he asserted that the Harbor Garage cannot be redeveloped unless tall buildings are permitted for the site. He said the buildings need to be of substantial size to produce enough income to offset the $155 million initial cost of the property and the $180 million it will take to move its parking spaces underground. 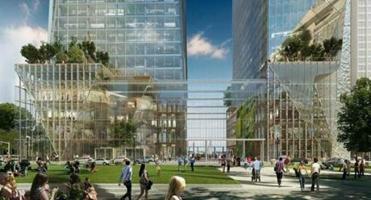 Adding open spaces in and around the site would also be costly. At the conclusion of his presentation, Chiofaro put in stark terms the choice that members of the waterfront planning committee — and the broader public — face. The committee is expected to make recommendations for Chiofaro’s site and other parcels by the fall.